wait, i thought you guys were the ones growing the Pot? o wait ... pots bad. you guys like to grow your opium. whats with you hatin' on Hinduism? 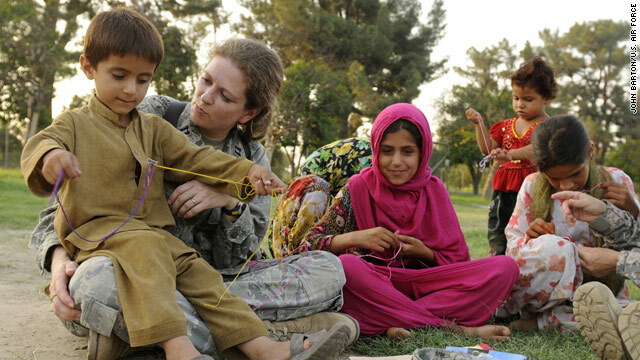 IF ALL AMERICANS FOLLOWED THIS GREAT LADY AND SINCERELY LOVED AFGHANS THEN IT CAN BE THE FIRST EXAMPLE IN AFGHAN HISTORY THAT AN INVADER SURVIVED AND RETURNED HOME SAFELY..
Is there a way to buy a friendship bracelet? I would love to have one. Can someone at CNN put me in touch with the Air Force Captain please. President Obama's speech to the Nation on this Tuesday is at the END of this month of August. The purported content is in regards to the flagging and failing Afghanistan War which now is running a whopping 60% disapproval on America continuing to even be in Afghanistan. It is not unusual for American Presidents to appear before the American people to address their concerns during wartime conflicts and to assess their fears and expectations in a forthright manner. The timing of this upcoming speech however is ominous and concerning. I hope the topic is actually about the war in Afghanistan instead of another neighboring middle east country.